This is your best bet of getting the pesticides off your fruit…(Hint: it’s not tap water). Recently, we published a shocking report that many items in the produce section carry residues of one or more pesticides. This means that consumers are literally consuming pesticides on their food, despite the safety claims of chemophile propagandists. But we have great news! If you want the best chance of eating clean food, there is now a tried-and-tested solution. According to a recent study published in the Journal of Agricultural and Food Chemistry, the most effective method of getting pesticides off of your produce is with a baking soda solution. The team soaked apples in specific pesticide solutions for 24 hours. In some cases, the pesticide went through the peel, but mostly stayed on top of the peel. Then, they washed the apples 3 different ways – a U.S.-EPA-approved chlorine bleach and water solution (similar to factory pre-washing), tap water and a one-percent baking soda water solution. Study author Lili He, a food scientist at the University of Massachusetts, Amherst, says researchers wanted to look at washing fruit from both the household and factory level. According to the results, it took about 12 to 15 minutes to completely remove surface residue and apples washed with the baking soda and water solution had the least amount of pesticides. Lili says that the baking soda solution washed away “80 per cent for thiabendzole and 95.6 per cent for phosmet using the solution after 12 and 15 minutes, respectively” but that the heavily saturated pesticides cannot be easily washed away. Thiabendzole has been shown to penetrate apple peels. Health Canada actually recommends washing your reusable grocery bags frequently because of pesticide residue and bacteria. It’s not just apples – Lili recommends using the solution on all sorts of produce like grapes, spinach and basil but cautions that no solution will get all of the pesticides all of the time. Most of the time there will still be residue. Peeling would be the next best option. 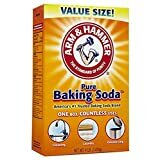 A mere one-percent baking soda water solution (just over 2.5 tablespoons of baking soda per gallon of water or 1 tsp per 1.5L of water). Leave your produce in the solution for 12 to 15 minutes for what is at least a surefire way to reduce your family’s toxic load.